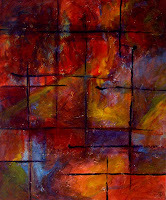 The Grid Series was initiated in the early spring of 2006 while I was still working on the Abstract series. I consider both of these series to be forerunners to the Genesis Series. The theme of the paintings in this group were inspired by light and energy intersected by lines. This was to cause visual “static” and communicate the effects of gridlock. Example: When we get going in a direction, we are charged up and excited about it and can’t wait to reach our goal or destination, but if the road turns sharply or dead ends, we have to take a turn and go with it or go in another direction altogether. All of the paintings in the Grid series consist of a textured under-painting, followed by various colors glazed over each other, resulting in 5+ layers of paint to achieve maximum vibrancy.